At home, my dog Sherman rules the roost. This Australian Shepherd mix came to us when he was three months old from a shelter near where our daughter Carrie was going to school at Eastern, Illinois University. Carrie was working for the EIU TV station and a co-worker covered the pet of the month. We had recently lost our old farm dog and one look at Sherman and it was all over. Today, he is eleven and was one of the best choices we ever made so I understand the passion behind David and Kelly Backes new charity Athletes for Animals. The charity was launched at the Mandarin Lounge in downtown St. Louis. David Backes is the Captain of the St. Louis Blues hockey team and well known for his talent on the ice. I covered the event with my youngest daughter Allie who is a Blues fan. Besides the guests that walked a red carpet for the event, there were a number of pets at the launch available for adoption. Athletes for Animals (A4A) are a united group of athletes, from all over the US and have participants in all types of sports. They are dedicated to making a positive impact on the lives of companion animals nationwide. The charity will spread messages of pet adoption, responsible pet ownership and focus on the benefits of spaying and neutering. “We believe that providing accurate information will help current and future generations make informed decisions about their animals, leading us to a more manageable pet population,” the Backes explained. As farmers more times than once we have had animals dumped on us. Our neighbor took in a lab mix that someone without a second thought just dropped off right outside their door this past week. I hope that this charity helps reduce animals being abandoned. 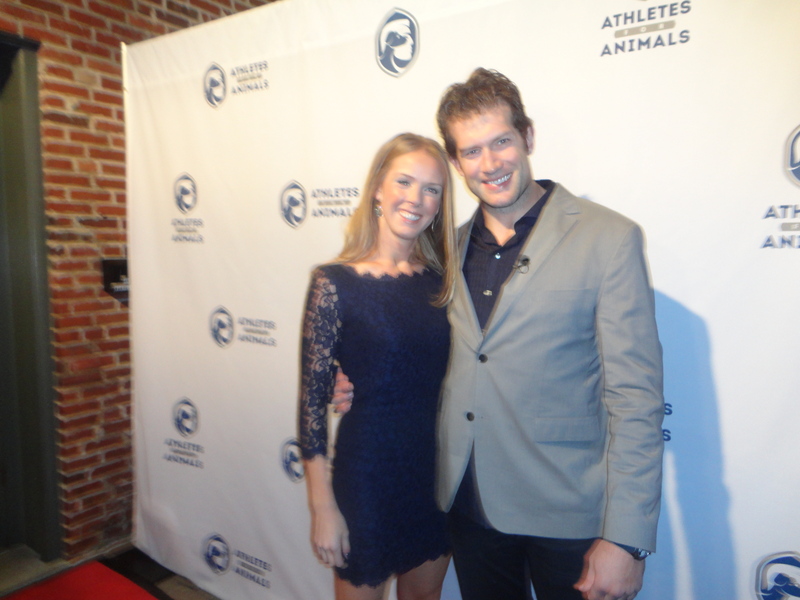 For more information about the charity, log onto http://athletesforanimals.org/. All proceeds donated to the ARA will be granted to organizations and charities that demonstrate best pet practices in pet care and adoption. The launch was located in a very neat neighborhood in downtown St. Louis and gave me a chance to cover a subject I care about and spend a little time with a busy daughter so it was a win-win night overall!